WARNING: This is a preview of Burst My Bubble. All components and rules are prototype and subject to change. In my house, the dishwasher is 39 years old and usually gets water all over his shirt. All too often, I put too much soap in the wash side [of the sink] and inevitably it gets in the rinse side. So I scoop it out and throw it back to the wash side. Then when I'm all done I drain the wash side and then try to destroy all the bubbles by using the rinse water. This is a fun game I play in my head, but now I can play it with my family! 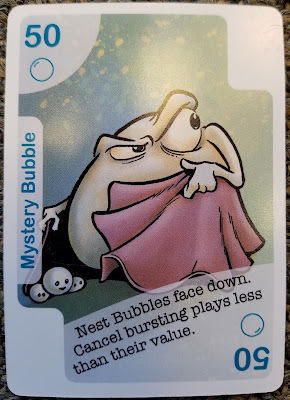 Burst My Bubble is a card game version of my OCD dishwashing habits. This 3-6 player game is a fun, strategic game of wits and timing. Each player starts with 5 cards and begins a "bubble up" phase of the game. 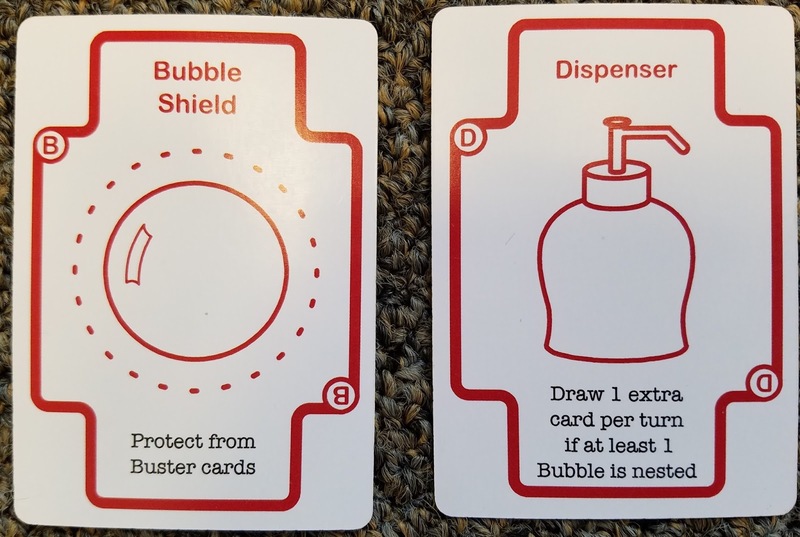 In this phase, each player attempts to build up their bubbles (like me putting too much soap in the wash side of my sink). 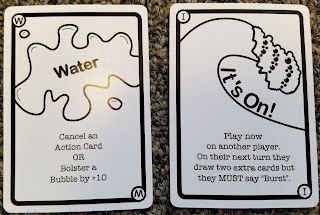 On a player's turn, they draw 2 cards, play an action card if they wish, and then will pass or burst. 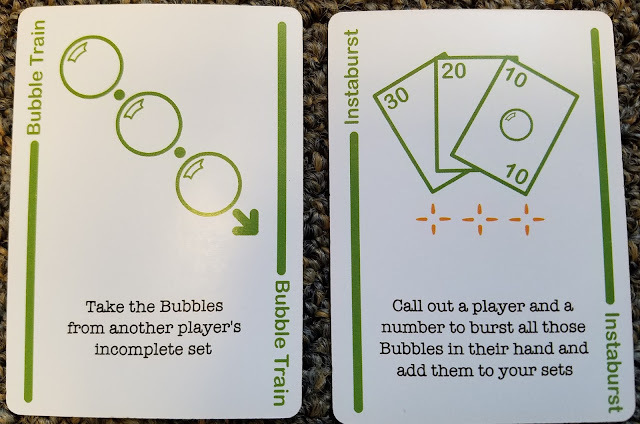 Passing just continues the "bubble up" phase with the next player while saying burst produces a second phase of the game that we will get into later. 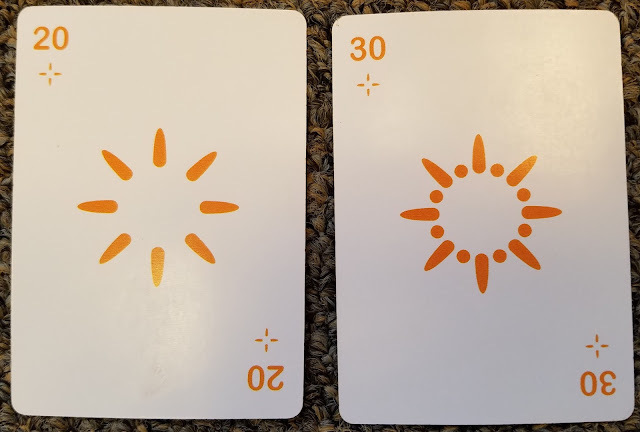 As players draw cards, they will come across several types. 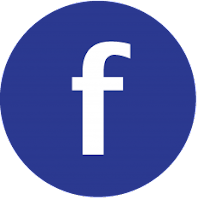 The most common are bubble cards (imagine that). These cards are of various point values (10, 20 or 30) with lower values being more common. 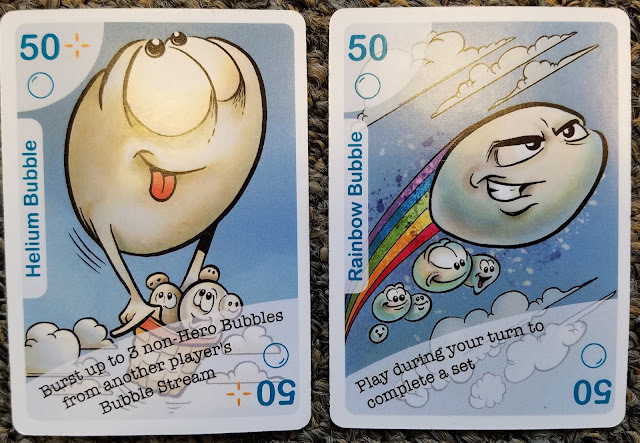 These cards will either bolster your bubble stream later or be stolen by another player with an action card. Two other kinds of cards that are a less common are defense cards, which are used in the burst phase, and special cards which have various effects on the game including forcing players to "burst." Then, there are the Hero Bubbles. These cards are special cards with special effects and super strengths. Some are advantageous for defense purposes and some add offensive firepower. These cards are key to the game. Just a couple of heroes here, nothing to see. When a player decides they have bubbled up enough they declare "burst" at the end of their turn. When this happens, they lay down all of the bubbles in their hand to create a bubble stream. 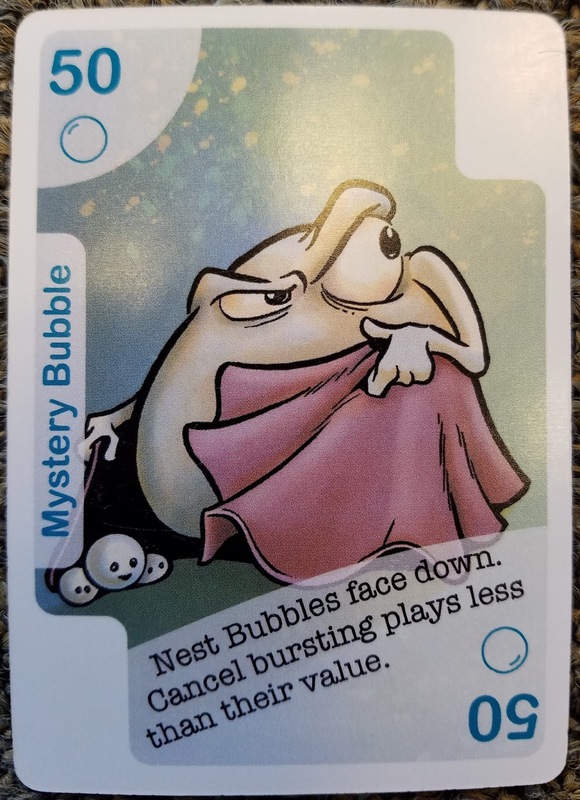 The bubble stream might include defense cards, hero cards, and special cards. All of the other players go into a mode where they take turns trying to destroy the bubble stream. This is where two other cards come into play, buster cards and pop cards. 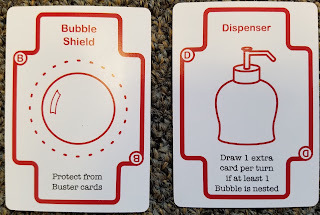 These cards are used to break down the bubble stream. Popped bubbles are added to the stack of the player who popped it for potential additional points. 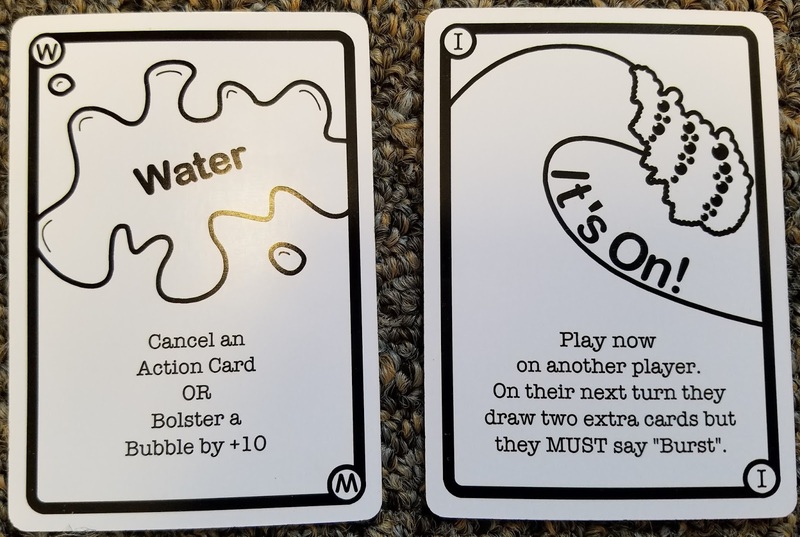 The bubble stream phase ends when either the bubble stream is completely broken down, or the other players can no longer play any effective cards against the bubble stream. 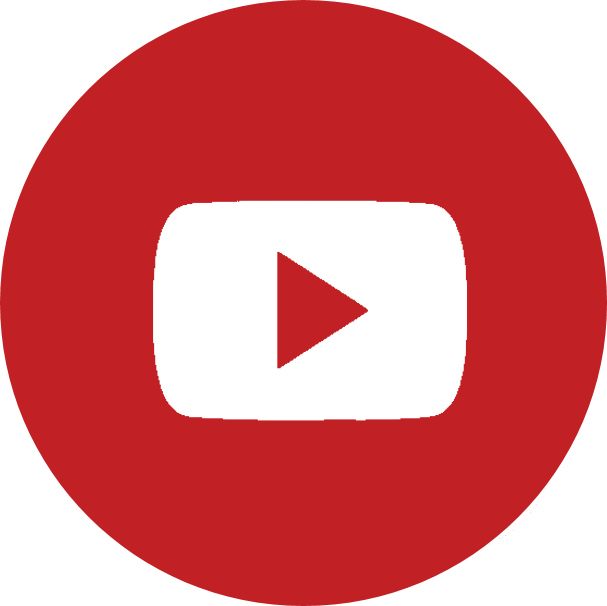 Failed bubble streams cause the game to continue while a successful bubble stream scores big points for the owner. The game continues until one player reaches 1200 points (or an agreed to number). As always, I start with the rule book. Burst My Bubble as presented to me was a prototype game. The game isn't terribly complicated, but the rules are not quite there yet. This is something the publisher has assured me will get fixed during the Kickstarter phase. A good rule book could push this over the top. Honestly, at the end of the day, we got there, so it wasn't horrible, just could improve a bit. Setup of the game is easy. Aside with adding or subtracting cards for the number of players, simply deal out some cards and start playing. I like games that get to a quick start. After we played through a couple rounds to figure out the rules, we were ready to go. The theme of bubbles is definitely one I haven't seen before. 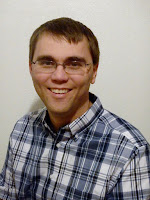 The publisher is chasing a retro style and the bubble theme fits the game and mechanics. The mechanics are a little different than anything I have seen. Basically, you build up an arsenal and decide when you have enough to let everyone attack you. If nobody decides, the arsenals of everyone collectively gets bigger. The bubble stream phase is where the game gets interesting fast. Luckily the game has ways to scale since in a three player game you are battling two players and in a 6 player game, it's 5 on 1. From the instructions, a "Bubble Stream" better than anything I could ever put together. As for gameplay, we played 4,5 and 6 player games and it works in those realms. We found the game to play on the shorter end of the allotted time frame of 45-90 minutes with none of our games lasting even an hour. The age range is also pretty accurate. My 9-year-old is a bright gamer and he was fine, but I think the range is probably right on. The cards that you play with are very good quality. My cards didn't come in any special box or case and there are a bunch of them. 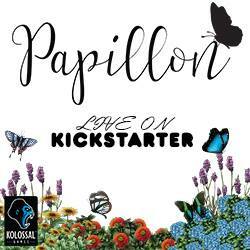 I think a good box would be a big addition for the Kickstarter phase. 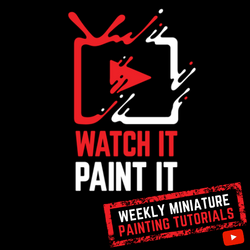 The art is clean and simple. Not something some will get excited about, but also not lacking for the type of game and audience. I love the different mechanics of this game and the style of play. Sometimes direct combat games can feel aggressive and cause hurt feelings, but in this game, you invite the confrontation when you are ready which is a different feel altogether. The publisher calls this a family game and it truly is. This is a game that will remain on my shelf. The rule book and overall presentation (box) can use some work, but that's what Kickstarter time and stretch goals are for, right? 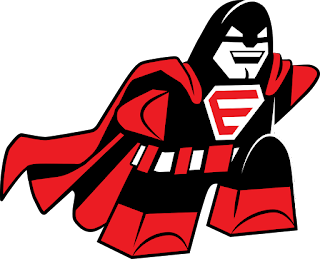 This guy was a unanimous family favorite hero. I'm a big fan. I see this one being a family classic if the publisher can get it into the right hands. The Kickstarter goal was already reached (before I could get this review published on the first day) and has a lot of upsides. If you need a good one for a family afternoon, hurry up and grab your copy. I am giving Burst My Bubble 9 out of 10 super meeples. On Kickstarter now until July 1, 2017. Great, thoughtful review. Thank you.